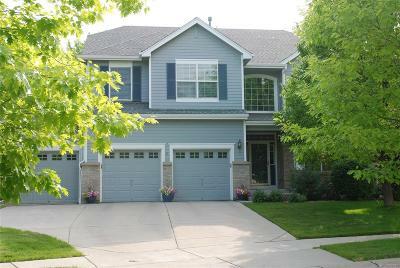 13013 Tejon Court Westminster, CO. | MLS# 7425300 | Tri-County Associates: Broomfield, Westminster Residential Real Estate. Impeccably cared for 5 bedroom, 3 bath Two Story home in the highly sought after Harmony Park subdivision! Located on corner lot of a quiet cut-de-sac, adjacent to the greenbelt & trail system. You will love the updates throughout the home to include granite countertops, tile backsplash & shower, tile flooring, lighting & fixtures, new high efficiency HVAC system, new hot water heater, newer roof and much more. The master bedroom includes 2 walk in closets, separate sitting area, 5 piece bath with custom tile. There are 4 additional bedrooms + loft upstairs for the family. The kitchen and family room are open to one another for spaciousness and also leads to the park-like backyard setting where you will enjoy lush, mature landscaping and gardens. The finished basement offers flex space + rough in plumbing and plenty of storage space. Walk to Adams 12 Five Star schools, parks, trails, dining and shopping. Located just minutes from Orchards Town Center too.